This is another scene along historic U.S. 40 -- my special highway. This time the location is thousands of miles to the west. 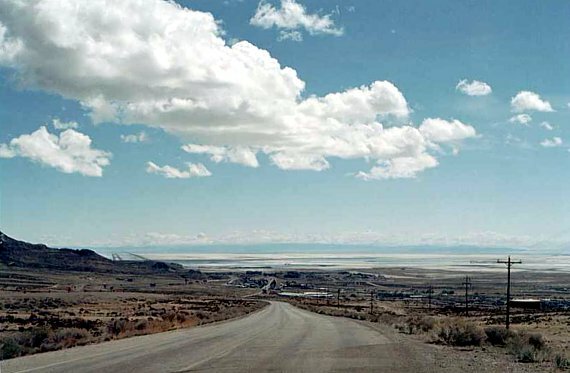 The view looks generally eastward from Nevada toward Utah's Great Salt Lake Desert. In the distance one may view the salt flats, cut indistinctly by the double plane of Interstate 80 heading straight off. The old road and railroad tracks are parallel in their own narrower paths to the right. The uphill road is marked nearby with a "No Outlet" sign, and ends not too far behind the camera. Surely only a few cars a day, at most, venture up this far.